Are you finding difficulty in managing the cards and documents of your college? Do you find your college administrative word tedious and daunting? Well, all these issues can be addressed well by opting for an iBonus Campus Card as it is the revolutionary card that helps you to maintain a track of student’s data without many hassles. It can be used by parents, students, administrative offices and finance staff to make the process of maintaining files and data easier and faster. 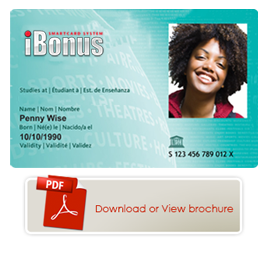 Now you can make your life easier by replacing the bundle of cards and files with a single iBonus Campus Card. It is designed to be used for different applications and purposes, from identification to making cashless payments at financial offices of your college. iBonus Campus Card is the ultimate solution for those who are looking for best solution to compile all the bundles of cards and files in one single card. This is a prepaid smart card solution and can be used by students as it offers a wide variety of advantages to students who enroll newly to any university and college. This smart card will serve as ID cards and even help them to make cashless payments to college for all their meals, books, parking and other necessities at the campus. So, now they don’t have to carry bundles of debit cards and files along with them, simply having iBonus Campus Card can solve the problem. Students can use this iBonus Campus Card for all their transactions within the college campus, without having to carry any cash, thus offering them more secure and safer alternative to cash. The iBonus Campus Card can become the excellent way to reward the students for each purchase they make within the school premises or college and they can enjoy the rewards throughout their school years or semesters. ⇒ Parents, students as well as staffs can now get real time web based portal access through which all transnational history details can be checked with ease and anytime. ⇒ The canteen attendants are only allowed to deduct the exact amount from the smartcards against the services, thus better services are provided to students and unnecessary transactions can be avoided. The prime objective is iBonus Campus Card is to render ease of use to administrators and students and also to save time and money. So, if you want to be the lucky one to have such innovative iBonus Campus Card then approach us today as we are up front and reliable company that do have best interests of customers in mind. You can rely on us as we endeavor to assist our clients in making cost-effective and right decisions so as to improve the bottom line of the company. We will be pleased to help all our clients 24/7 and they may contact us at +971 4 3338681 or write us an email on iBonus@avi-infosys.com and one of our representatives will get in touch with you.